‘Every time you smile at someone, it is an action of love, a gift to that person, a beautiful thing.’ Mother Teresa. A simple and lovely quote from a simple and lovely lady. But, is it true? We could answer it with another quote, ‘Beauty is in the eye of the beholder’, Shakespeare expressed a similar sentiment in Love’s Labours Lost – ‘Beauty is bought by judgment of the eye’. The meaning of both these last two quotes is that different people have different opinions about what is good/beautiful/valuable. However, another aspect of this may not so readily occur to most people; what about those who have visual impairments who cannot ‘judge’ with their eyes? The 55% section of these figures refers to what are grouped together as “body language” “. 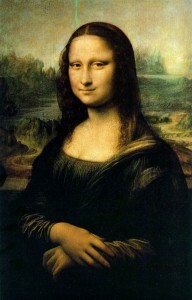 Mona Lisa - possibly the most famous enigmatic smile ever? This whole subject of body language, of which a smile is an obvious one, has a different slant when viewed in respect to a person for whom visual hints are unreadable. Many people have hearing as well as sight loss, which means in the most profoundly affected cases, they may only receive 7% of the full meaning of a conversation. From a personal point of view, this was brought to my attention through meeting and marrying a man who is blind. With other friends, I would make eye contact, through facial expressions and body language, we could each convey our emotions, attitudes and quite complicated messages, without uttering a word. The difference between visual and non-visual forms of communication are brought sharply into focus (no pun intended) when, like me, even after 8 years of marriage to him, you find yourself waving to a blind man across a room to attract his attention! We have many friends with varying degrees of sight loss, from the relatively slight to total, life-long, blindness. Rob, my husband has gradually lost all his sight and does miss not being able to read body language any more. But even though we have instinctively found ways to at least restore some of the balance in our communications together, it can still lead to misunderstanding. The most obvious example of this is where I began this post, with a smile. If I make a remark that sounds serious or condemning but is not meant that way I would show my intention by adding a smile. Rob would miss the smile and maybe think I was being rather negative. For example, was I to say to a sighted friend, “You are a nuisance!” and smiled at them they would know the message was not unkind. But if I said that to Rob he may think I was rather unhappy with him. We can simply avoid these misunderstandings by a trick I learnt when training long ago as a telephonist by putting an audible smile in your voice! This sounds obvious, but try speaking to someone on the phone and understanding every nuance of their conversation, not so easy as talking face to face, is it? When I met Rob 9 years ago, I had never known anyone with sight problems before. I did not know how to help him feel part of whatever was happening around us in company. This is why we wrote the 12 Myths of Blindness for the Echurch website. (We no longer have the website but I have added our (updated) Twelve Myths to this blog. These ‘Myths’ have since been “borrowed” by other organisations online. We used them as the base for the talks we have given on “Living with Blindness” to many groups. I can tell you from a sighted persons point of view it is really hard to remember that Rob can’t see when folk nod, smile, or wave to him. I still do it, after 8 years of marriage! One sad aspect of this whole body language problem for blind people is when they are at a gathering for a meeting, party, church, club etc. They can come away feeling hurt that their presence has been ignored by others there. When, in reality, several people have smiled, nodded, or waved to them! When you meet a visually impaired person, go up to them, introduce yourself by name. If you know their name use it, then they will know that you are speaking to them and not someone else. This is particularly important if there are other people about. To further attract their attention, gently touch their upper arm with your hand. When you are leaving, say you are going away. Nobody likes to find that they have been speaking to an empty space! It all sounds very simple but what is blindingly obvious (pun intended, people don’t lose their sense of humour along with their sight) once it is explained to you, can be the cause of much hilarity or much hurt. An example of the former was when I was trying to talk to the receptionist at the doctors and guide Rob to his seat in the waiting room at the same time. He turned in the wrong direction and the man whose lap he was about to sit on waved him away in embarrassment, at the last second he realised Rob’s problem and shot out of his chair, ran out of the doctors surgery and missed his own appointment – everyone else tried to stifle their laughter till I explained to Rob what had just happened, he roared with laughter and everyone else now felt free to join in! As I said, blind people do have the usual portion of humour, just that it can be dented when folk don’t include them in what is going on in a way that they can appreciate. Rob and Catherine enjoy walking wherever we go. So now you have a little bit more information – by the way, many, many people and businesses seem to assume that Rob can’t use stairs, most people understand the difficulties faced by people with mobility problems, but forget that most visually impaired people are reasonably fit apart from their sight. In fact a friend who is looking for work has been told he can’t go to the upper floor of the Job Centre, though he has now fought a battle over that and won! 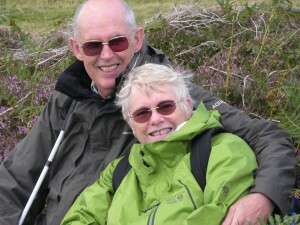 Our favourite occupation is walking, especially in the Northumbrian Hills near us, though many people seem bemused as they meet us on craggy moors, miles from anywhere, I reply to friendy comments with – “Rob is fully fit, only his eyes don’t work!. In fact our local branch of a supermarket giant has so-called ‘disabled’ toilets with a coloured light door-lock system, when I pointed out Rob’s problem they said they would change them, a year later and they are still inaccessible to visually impaired people, I did tell them that only 8% of folk registered disabled in the UK use a wheelchair, a simple lock would serve everyone, whatever their issues. What works for both visually and mobility impaired people are solutions that are well thought out and sensible, then we can all enjoy life on more equal terms, and enjoy a few laughs along the way! P.S. Is Rob the only blind person who has gone home from the pub on a mate’s arm and only remembered part-way home that he had gone there with his guide-dog? She was still curled up asleep under his table at the pub when they rushed back! This was before I knew him. He does not need or have a dog now. I am from Grand Rapids, Michigan, USA, and am good friends with MANY blind or visually impaired people, and the mother of a 14 year old blind daughter. I appreciate this article! Thank you. How do I subscribe? Hi Kelly, nice to hear from you, I am not sure what you mean by’ subscribe’, if you want a notification when I add any more posts to my blog you need to use the RSS feed function which will tell you what to do. Hope this helps. Rob and I spent a month in Oregon this summer and met some great folk there from the American Council of the blind of Oregon. I don’t know why it took so long for Google to find it, it is just a blog so maybe that is why?